England's world champions Laura Massaro and Nick Matthew are through to the British Open semi-finals after both secured 3-0 wins in Hull. Massaro beat compatriot Sarah Kippax 11-8 12-10 11-8, and Matthew defeated Egypt's Fares Dessouki 11-4 12-10 11-9. Both will face Egyptians in the semis as Matthew, 33, plays Mohamed El Shorbagy and reigning champion Massaro, 30, takes on Raneem El Weleily. "Mohamed has beaten me the last two times we have played," said Matthew. "He's hungry and has all the qualities of youth but it feels like he's been around for a long time as he has maturity as well and is definitely the complete article. "He won't give any consideration to me being world champion or playing at home - he's an incredibly tough player and I expect we'll have another hard battle tomorrow when hopefully experience will sway it for me." 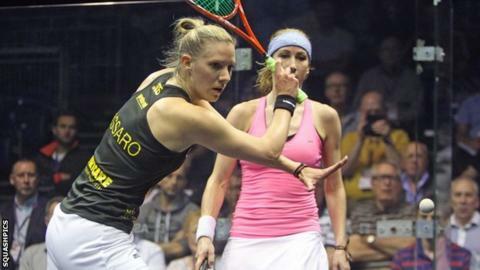 Massaro remains on course to play Malaysia's top seed and seven-time world champion Nicol David in the final. "After I won the event last year, it was a bit of a surprise," said the Chorley-based player. "It took me a while to get my head round it and realise that everyone was still gunning for me. I feel really good to be in the next round." Asked about her semi-final opponent Raneem El Weleily, Massaro added: "She's phenomenal with the racket and I'll have to be on my game plan 100%. "We've played in the last three events and I'll have to be fully focused." David beat Omneya Abdel Kawy of Egypt 11-7 12-10 11-4 and will next meet English fifth seed Alison Waters, who saw off fourth seed Joelle King of New Zealand 11-4 8-11 11-5 11-1. Men's defending champion Ramy Ashour of Egypt beat Englishman James Willstrop, a former world number one, 11-6 11-5 11-7, while world number one Gregory Gaultier of France went through after Egypt's Amr Shabana was forced to retire through illness.